The attack on workers pensions and on social security is now another front in the agenda of global free trade and the privatization of the State. It is occurring world wide in the majority of G8 and G20 industrialized countries workers are seeing attacks on both social security and on their workplace pensions. Politicians, the business lobby and their right wing think tanks ( Cato Institute Social Security Reform) are now doing their best imitations of Chicken Little running around crying the sky is falling over pensions and social security. Following their success of foisting the so called debt and deficit crisis, during the Reagan, Thatcher, Mulroney era of the early 1990’s, on the public to get us to take wage cuts, and to lay off public sector workers in order to privatize the State they are now focusing on privatizing other social benefits. How quickly they changed their tune when it comes to debt and deficit, when it affects corporate debt, which has increased, personal debt or state debt now that the United States is in its self-declared state of war against the phantoms of 9/11. Under George Bush ll the US has amassed a trillion dollar deficit, and it is in a debt crisis over trade. But hey nothing to worry about says the right wing pundits, who in the nineties were proclaiming the end of the world as we know it. What they wanted to end of course was the Welfare State, and having done it through outsourcing, reducing unemployment insurance, (Chile Leads The Way With Individual Unemployment Accounts) work for welfare, privatization of public services, reducing public health services, now they cast their eyes on the goose and its golden egg; social security and pension funds. The push to gut Social Security as well as private pension plans is just the latest item in the agenda of pernicious capitalists to get their hands on liquid capital to invest with. In order to counteract the falling rate of profit, more money needs to be circulating in the marketplace. 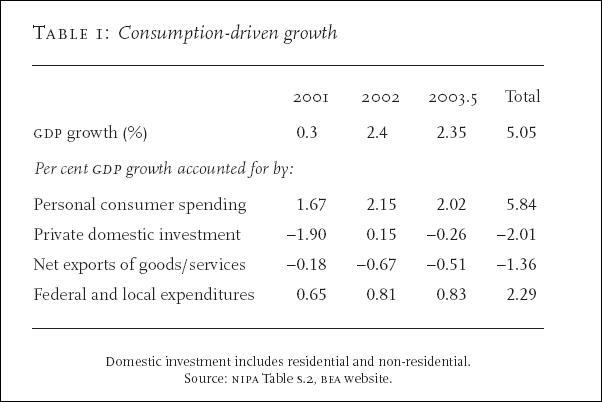 This coincides with the United States reliance for the past three decades on increased consumer spending versus manufacturing to prop up American Capitalism (see Brenner in Appendix). The formula, money-commodities-money (MCM), now dominates this period of late (decadent) capitalism. It no longer requires manufacturing of goods, or land rent, to expand, it requires a liquidity of capital circulating in the market. But even this will only be a temporary skid on the falling rate of profit, as shown in the articles below. That is because capitalism world wide has hit a wall of overproduction and overcapacity. This then is the true face of Free Trade. The industrialized countries open up their borders for the free flow of capital, as productive labour is outsourced to the newly industrialized areas of the world. Underdeveloped economic zones are seen as investment and production opportunities while factories and manufacturing are reduced in North America, Europe, Japan, and the other older industrial countries. In those countries workers are laid off, outsourced, or privatized. This frees the capitalist from having to pay benefits or wages. The capitalist state now models the market place, there is no civil society only the preptual market place. The state has benefited by outsourcing services, freeing itself from unions, wage increases and benefits including unemployment insurance, health care and pensions. Corporations are free to declare bankruptcy and throw their workers out onto the street, while stealing their pension funds in order to refinance their amazing resurrections. WorldCom may have collapsed but through the magic of the marketplace, it has reappeared again as it once was as; MCI. Air Canada demanded its workers take huge roll backs in wages, and it too wanted to gut their pension plans, in order to supposedly be attractive to investors while in bankruptcy. Stelco Canada has done the same thing, and it goes on and on around the industrialized world, corporations that were solid one day, “melt into the air” the next, as Marx said. Private sector pension funds have regularly been underfunded by corporations in order to invest on the stockmarket, usually purchasing back their own shares, and in excessive salaries and stock options to their executives. A case in point with Air Canada, who demanded workers give up salaries and pensions, while rewarding its executive with enormous payouts while in bankruptcy. While creditors and banks collect on their monies from the bankrupt corporation, its workers are left broke and out in the cold. The NDP 's“Worker’s First Bill” (C-281), is a social democratic attempt to address this problem in Canada. No wonder Wal-Mart is the largest employer in the US. It IS the ideal free trader. Non union, low waged, flexible work time, personal benefit plans for health care and pensions, which the worker pays for themselves, goods purchased offshore from China and other outsourcing countries, just in time shipments, Wal-Mart is the poster child for America adapting the Chile model of free trade and privatized benefits. The current crisis in private benefit plans and pensions being underfunded as well as underfunding of state social security plans is a crisis of captialism, one that supposedly doesn't exist in the so called 'boom economy". The crisis is not of lack of funds, but of capitalists who see cash sitting idle, wanting to get their hands on it to have it circulating in the economy for their benefit. They have used their liquidity to invest in the boom and bust stockmarket, and in most cases the returns have been a bust, according to a survey by Deloitte Touche (see appendix). In Canada while social security is stable due to increased payroll taxes introduced in the nineties, the Government is still talking about ending "forced retirement" ala the Chile model. Allowing workers to work longer is a campaign now ongoing in the media pushed by the new Liberal government. Working past 65 might be ok if you are a shipping tycoon like our current PM, but if you work in a physically demanding job, early retirement means you may actually to live long enough to enjoy it. The Free Trade agenda is to privatize all state benefit plans, to force us to work for ourselves and to pay for our own health care, extended care, pensions and even unemployment insurance, in order to have money circulating in the system as widely as possible. It will benefit the banks and their insurance companies, who will provide us our private benefits. Civil society ceases to be what it once was as we all become indentured servants not only to our employers but to financial monopolies for our benefits. GE investments which owns NBC and a variety of conglomerates had a profit because of its investments not because of sales. GM only reported a profit because of its GMCredit business, not because of car sales. With access to more liquity from pension funds financial institutions will continue to merge with each other and with manufacturing and industrial sectors at an increasing rate. Capital has been invested much more efficiently in the United States than in Germany or Japan. More detailed analysis indicates that there is much over-investment in Germany and Japan and, hence, unutilized capacity. In particular, Germany has witnessed much "gold-plating" of capital investment, that is, the installation of equipment that is much better -- and more expensive -- than is required.3 Moreover, there has been no offsetting improvement in labor productivity. Consequently, despite heavy investment, living standards have not improved significantly in Germany or Japan relative to those in the United States. Why is there inefficient investment in Germany and Japan? It is not caused by lack of investment tools because managers in both countries have access to the same tools that U.S. managers use to identify productive investments and to [*pg 88] operate them efficiently. The over-investment must be caused by German and Japanese managers' decisions leading to excessive investment relative to the standards of economic efficiency. This article suggests that there is inefficiency by design, induced by the goals and systems of corporate governance in these countries. Bradley et al. categorize corporate governance systems as either "contractarian" or "communitarian." At the risk of oversimplification, a contractarian system encourages firms to focus on shareholder value. A communitarian system, in contrast, responds to all "stakeholders:" creditors, employees, customers, and communities where corporate operations are located and, finally, stockholders. The concern for a much broader constituency may lead to over-investment, often to the detriment of shareholders. Over-investment helps creditors, particularly when firms diversify because of co-insurance effects, and it helps employees because diversifying investment creates jobs and improves job security. Furthermore, it aids customers by creating more consumer choice, and it helps the community by broadening the tax base. The Big Lie fed to workers is that RRSPs (in Canada), IRA and 401k in the US, or any other private pension fund, is that they are more effective in saving you money for your retirement than a defined pension plan at work or social security. Acctuarial accounting proves they are not. A report issued in 1999 by the accutarial accounting firm William Mercer comparing RRSP investments and the Canadian Pension Plan (CPP) to RRSP's showed that for a retired couple living on a combined CPP and Old Age Security annual pension of $25,000 it would take over $300,000 in RRSP investments to earn enough interest to match that. This puts the issue in a whole new light. Even with the so called secret of compound interest, what average worker can save that much. Especially when the average worker in Canada does not have an RRSP even now. Those that have RRSP's which are a tax break until cashed in, are all in the higher income brackets. The Free Trade agreements are one small aspect of the shift of capitalism from production to (financial) services. We now face the continual threat that the world we now live in will soon look like that one our parents lived in prior to World War II. And of course those who lived through those times of capitalist depression are almost all gone now. Capitalism is counting on the social amnesia produced by its media fixation with the here and now for us to forget that the Welfare State was not something given to us, but a reform created to avoid a social revolution after WWII. Every struggle to hold onto wages and benefits cuts into the profits of capitalism, profits that it needs like a junkie needs heroin. Every struggle to make the bosses pay out of the surplus value we create, is a battle in the class war. And the capitalists understand this better than anyone. The right wing declare the least resistance to their plans as 'class war' while the social democrats and trade union leaders will do their utmost to assure them it isn't so. Class struggle is more than petitions and bills in parliment, it is the refusal to accept the way things are. It is the seizure of factories that stand abandoned in Quebec, Argentina, or Lesotho. It is a global general strike, when capital tries to close a factory in one country to ship jobs elsewhere. It is the refusal to accept empty office spaces when people go homeless. It is the global rent strike against landlords and profiteers. It is our "morality" against the "morality of the marketplace". Free trade is the privatization of all aspects of civil society. The global business agenda has been declared, no national state can defeat it, no single campaign or mass protest can halt it. It is the machine logic of everyday life in a capitalist society, go to work, pay your debts, pay more and more just to survive, only to be told you are better off than someone else so shut up and accept it. It is the perputal war of those who have against those who have not, it is barbarism with a happy face. It is the phony reality of reality TV, while millions starve out of sight of the cable network cameras. Capitalism, like the vampire it is, will never stop squeezing even more profit out of each of us while assuring us its for our own good, telling us we should feel 'empowered', that we are stakeholders/shareholders in our own exploitation. Workers world wide now face the same common enemy, the same assault everywhere Workers of the World Unite was never more meaningful. To stop capitalism we must refuse to produce the surplus value it so direly needs, we must organize a global social revolution to stake it firmly in its black heart. To do that we need to realize our class conciousness, not as consumers, or citizens but as proletarians, as the creators of capital. There is no capitalist who can exist without our labour, we are not cogs in the machine, we are the very machinery of capitalism, without us the machine will halt. TORONTO (CP) - Choosing the right investments for a registered retirement savings plan are more stressful than going to the dentist, but less stressful than asking for a raise or proposing marriage, says a new survey from Royal Bank. On a scale of one to five - where five means the activity is extremely stressful and one means it's not stressful at all - asking someone to marry you and writing a final exam had an average score of 3.3. Making a speech or presentation, or asking for a raise, scored 3.1. But the stress of planning for your financial future scored 2.9, while saving for a comfortable retirement and choosing the right RRSP investments had a 2.8. Going to the dentist scored 2.6, but making an RRSP contribution scored just 2.1. "As the final deadline for RRSP contributions approaches, last-minute contributors are not alone when it comes to anxiety about what to do and where to put their money," said Matt Varey, head of career sales forces at RBC. "Choosing the right investments to match your goals is extremely important. Carefully reviewing options with a professional will make the process less gruelling than anticipating a potential root canal." The survey findings are the result of an RBC Financial Group/Ipsos-Reid poll conducted between Nov. 4 and Nov. 23. It sampled 1,201 adult Canadians and the results were considered accurate to within 2.8 percentage points, 19 times out of 20. The Liberal Government Budget has included a boost in RRSP savings. And who does this help? "As for the increase in RRSP contribution limits, it will only help people with annual earnings between $100,000 and roughly $122,000 by 2010." - Workers' Centre of the Communist Party of Canada (Marxist-Leninist) -The following discussion is prompted by the proposals contained in the Ontario NDP Caucus Discussion Paper entitled "What's waiting for you when you finish work?" presented by NDP Pensions Critic Andrea Horwath. All quotes in italics are from the Discussion Paper, followed by Workers' Centre comments. The Ontario New Democratic Party believes that everyone deserves the right to a secure pension. The concept of "my pension" blocks dealing with the problem of providing a Canadian standard livelihood for all Canadians during retirement. "My pension" signifies a relationship between an employee and an employer that results in an uncertain obligation to provide a pension during retirement. According to the "my pension" concept the government intervenes if some problem disrupts the terms of that relationship or the obligation is not fulfilled. The intervention results in the obligation only partially fulfilled and the employer or fund either subsidized by government or simply let off the hook. Importantly, most Canadians, which is acknowledged by the Discussion Paper, do not even have a "my pension." Francisco International Airport, Rich Lesnik retired early at age 56.
they believed to be "untouchable" are not. pension," Lesnik said. "I consider myself lucky compared to them." three-fourths since its peak in 1985 to 31,135 in 2003.
double whammy of declines in the stock market and interest rates. by more than $6 billion. and state government employees into 401(k)-type plans (see related story). Online PetitionWorking Canadians must contribute to the Canada Pension Plan (CPP). There are now 16 million of us who have contributed to, or who benefit from, the CPP. Most do not realise that the CPP has invested at least $2.55 billion in domestic and foreign military corporations, including 15 of the world's top 20 war contractors. Register your opposition to CPP investments in the business of war! Please sign this petition to urge the Liberal government to stop the CPP from investing in businesses that profit from war and demand that they divest now! WASHINGTON - Unions and business groups said they were concerned over a government proposal to raise the premiums that companies pay to help finance a federal agency that protects private sector pension plans. The concerns were raised Tuesday at a Senate Finance Committee hearing examining a broader Bush administration plan aimed at shoring up the Pension Benefit Guaranty Corp. The agency insures traditional, defined benefit pensions covering 44.4 million workers and retirees. Defined benefit pension plans promise to pay a specified monthly benefit at retirement. These plans are prevalent in older industries, such as automobile manufacturing, steel and airlines. As part of the larger overhaul plan, the administration has proposed increasing the current premium of $19 a year per worker or retiree to $30 a year. The current premium was set in 1991. To change it, congressional approval is needed. The agency's operations are financed largely by insurance premiums, which are paid by companies that sponsor traditional pension plans. The agency is not funded through tax revenues. Higher premiums would place a burden on companies, opponents said. "This would be especially hard on companies that are already experiencing economic difficulties and on medium-sized and small businesses," said Alan Reuther, legislative director of the United Auto Workers (news - web sites) union. Larry Zimpleman, an executive at Principal Financial Group, who also testified on half of the Business Roundtable and other business groups, agreed that higher premiums were a concern. "While we believe that reform is needed to address the growing deficits at PBGC, we feel that the best way to deal with that problem is to keep more employers in the system, not to tax them out of the system," he said. The agency program that covers single-employer plans has reported a record deficit of $23.3 billion. Randall Kroszner, an economics professor at the University of Chicago, urged Congress to act to bolster the pension system. "It is a ticking time bomb waiting to explode and the longer we wait to defuse it, the more powerful the blast will be," he said. And here is the result of Chile's miracle of Privatization. Chilean workers dividedUnder the heavy-handed regime of General Augusto Pinochet, universities, state-operated companies and the national health system all fell into the hands of powerful industrialists. Since the beginning of January this year, Chile — where labour laws are the least stringent of any country in Latin America — has been the terrain for a difficult process of labour law reform. It has recently reduced its mandatory working hours from 48 to 45 hours weekly. But trade unions are dealing with their own demons as well. From the south of Chile, a regular rabble.ca correspondent describes workplace changes taking place at a naval industry plant owned by Asenav, the nation's leading ship-builder. Retirement Income: Canadians’ Worries IgnoredOTTAWA - As Canadians get to the March 1 deadline for contributions to RRSPs, the Canadian Labour Congress releases a paper on pensions. The statement “Workplace Pensions: Current Difficulties and Going Forward” proposes solutions after a survey of the sorry state of public debate on pensions in this country as our population ages. It is also a renewed call on the federal government to provide leadership to reassure Canadian working citizens about their prospects when they retire. With “Workplace Pensions: Current Difficulties and Going Forward,” the Canadian Labour Congress re-opens the debate on pensions. TORONTO (CP) - Stronger domestic economic growth in the coming years depends on better education and skills training now, says Bank of Canada Governor David Dodge. In a speech for students at Humber College, Dodge said that as Canada's population ages, skills training will become increasingly important. "The more innovative we can be in skills development, the more innovative we will be as a nation," Dodge said in notes for a speech to be delivered Wednesday night. "And that is the best way to promote sustained, long-term economic prosperity for Canadians." About one in eight Canadians is aged 65 or older, Dodge said. But by 2026, that ratio rises to one in five and that will dramatically increase pressure on Canada's social services. That in turn will require a more productive, skilled workforce to support the economy, he said. It may also mean that older workers will need to retrain so those who want to can stay on the job past conventional retirement age, Dodge said.